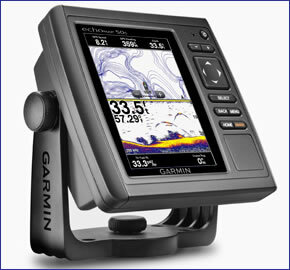 The Garmin echoMAP 50s is a standalone combination marine chartplotter and sounder GPS system. Featuring a 5-inch VGA display which is built into a rugged and waterproof casing. The echoMAP 50s also features GPS/GLONASS that is 10Hz which keeps your position and heading up to date 10 times per second meaning it displays fluid vessel movement. BlueChart g2 mapping covering the waters around the UK and Ireland and worth £199.99 are also included when you buy the 50s from ActiveGPS. The Garmin echoMAP 50s is also wireless compatible. Garmin echoMAP 50s and echoMAP 50dv have both been discontinued. Although both models have been discontinued, we still sell accessories for both the echoMAP 50dv and echoMAP 50s. In addition you can buy marine BlueCharts. The Garmin echoMAP 50s is a combination marine chartplotter and sounder that has a 5-inch VGA display. The echoMAP 50s has buttons down the side of the navigational device and this allows for quick access to the menu and various screens/options. If you're looking for a larger display which is also touchscreen, then you need to look to the next model up - the echoMAP 70s. The 70s features an wider 7-inch display with multi-touchscreen technology. You can accurately mark and navigate to 5,000 waypoints, 100 routes, 50000 track log points or interest or 50 saved tracks. There is also a sonar recording capability meaning it corresponds the timing of the sonar with your boats position and saves the digital information on a map. Furthermore HD-ID target tracking means better definition of images taken with the echoMAP 50s’s Sonar. Along with all this storage and technology means you can mark fishing spots and return back to them as and when you choose to and get the best images available of what's in the water below. ‣Through-hull mount - for non-outboard powered boats. For wooden, steel boats, etc. To find the perfect transducer to partner your echoMap 50s or echoMap 50dv and your boat please complete our online form here. Pictured below, transom mounted transducer, thru-hull transducer and in-hull transducer. The echoMAP 50s also measures water temperature with a sensor (log and graph). There are even flexible brightness levels making it daytime readable and it also offers low-light dimming for night time use. Tide tables are also included with the echoMAP 50s. The echoMAP 50s is preloaded with BlueChart g2 for the entire coastal waters of the UK and Ireland, plus Northern France, Belgium Netherlands and North West Germany which may be all you ever need. However, the echoMAP 50s also features an microSD card slot so you can load additional marine charts to the chartplotter. Also available are BlueChart g2 Vision, the g2 Vision version provides extra features including; 3D Mariners Eye for 3D information above the waterline and 3D Fish Eye for 3D information below the waterline. 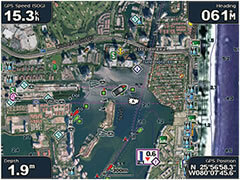 BlueChart g2 Vision maps also feature high-resolution satellite images for help when navigating unfamiliar waters. There is also an Auto Guidance feature that will navigate you along your chosen route avoiding shallow water, buoys and other obstacles. Garmin g2 Vision are available in a variety of sizes from small areas e.g. Portugal right up to a large area e.g. the waters around the UK and Ireland. For more information about Garmin g2 Vision charts/maps click here. Please note: There are two different versions of each chart - g2 and g2 Vision. ‣HD-ID target tracking means better definition of sonar images - easier to find fish! Garmin echoMAP 50s marine chartplotter/chartplotter comes preloaded with Garmin BlueChart g2 UK and Ireland mapping (pictured right). In future years you can purchase a marine map update SD card to update the preloaded UK and Ireland charts on the Garmin echoMAP 50s/50dv. Looking for Garmin echoMAP 50dv or echoMAP 50s accessories? Accessories available to purchase include 5-inch protective cover, flush mount kit and second mounting station. If you'd like to add a transducer to your echoMAP 50 please see this page. Add Garmin BlueChart g2 HD and g2 Vision HD marine charts to your Garmin echoMAP 50dv/50s, view the different charts you can buy from ActiveGPS here.